This week, we had a sketch challenge. Mornin’, y’all – welcome to another edition of the Happy Stampers Blog Hop. I hope you’ll settle back and spend a little time checking out all the projects we ladies-who-hop have built for you today! Now – this one should have given me an “aha” moment. But my brain was blocked. Don’t know why, exactly, but it was. So I ended up making a card from an idea that I finally forced myself to have. All us Happy Stampers Hoppers worked from a color challenge this week. Mornin’, y’all – welcome to another edition of the Happy Stampers Blog Hop! We’ve got a fun sketch today and I’ve interpreted it in a….tropical way. To match the return of the muggies here in Savannah! And traffic. This was a card for a friend at work. He’d gotten a Mother’s Day card from me. Then a birthday card for his daughter. Then he asked me for a “love” card for his fiancee! This is a woman he knew way back when they were teenagers – then they kind of went their separate ways for 40 some odd years – and now they’ve found each other again. 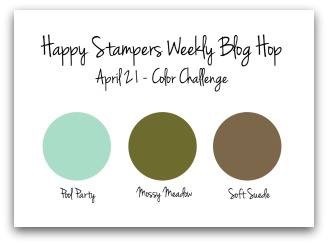 Mornin’, y’all – it’s Thursday and that means it’s Happy Stampers Blog Hop Day! We’re almost thru the week – yeah! – and the weather is gorgeous here in the deep South! Spring in the South is the bomb-diggity. When we get some, that is! And we’ve got a few days where the weatherman is promising just that! I do hope you’ll hop thru all the ladies’ blogs today to peruse (and comment on!) all of their projects! I started with a panel of Crumb Cake card stock – onto which I heat embossed the image from Sweetbriar Rose. I inked the stamp with Versamark Ink, stamped the image and sprinkled it with Copper Stampin’ Emboss Powder (2016-2017 Annual Catalog).